Our off-site satellite extension, developed due to popular demand, houses forty-five children aged six to twelve years. Transportation is provided to and from seven neighboring schools: Aloma Crescent Public School, Birchbank Public School, Cardinal Newman Catholic School, Clark Blvd. Public School, Dorset Drive Public School, Folkstone Public School and St. John Fisher Elementary School. For families who are moving or wish to help friends and family find the Mini-Skool center nearst to them, Mini-Skool’s school finder is a fast and easy way to find the closest Mini-Skool center. At our Bramalea child care center, we have a wonderful staff and a very low employee turnover. In fact, a large number of our teachers have been here for ten years or more. 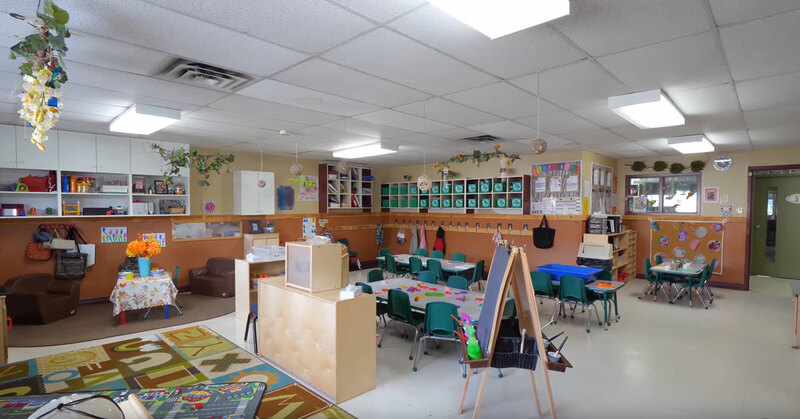 We have created a home away from home for our children at Mini-Skool’s Bramalea day care. When you visit, you will experience an atmosphere that is bright, cheerful and childlike. Your child will have the benefit of a space custom-designed for children. From their earliest days at Mini-Skool, children are encouraged in their development with features such as our Discovery Areas, where early childhood development is stimulated through a variety of hands-on activities. Please call us at 905-792-2230 to arrange for a full tour of the Bramalea child care center, or drop by to experience the laughter, love and learning we so proudly provide each and every day. We look forward to your visit! ”Signing our children up with Mini-Skool was the best thing we have ever done.